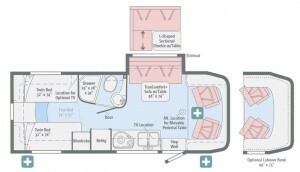 In the Winnebago Revel, an accessory that is nice to have if you are wanting to drain your fresh water tank is Lichtsinn RV’s fresh water drainage tool. In the Revel, if you want to drain the fresh water tank on the bottom side of the Revel there is a fitting that looks very similar to fittings you will find in residential applications. The fitting uses a square release to run it counterclockwise to open it and then the fresh water tank drains on the ground. 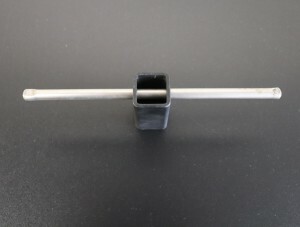 WATCH OUR VIDEO ON THE REVEL FRESH WATER DRAINAGE TOOL HERE. Lichtsinn RV created this tool for owners who will want to winterize their Revel using the “dry method” meaning owners will not use RV antifreeze to winterize. 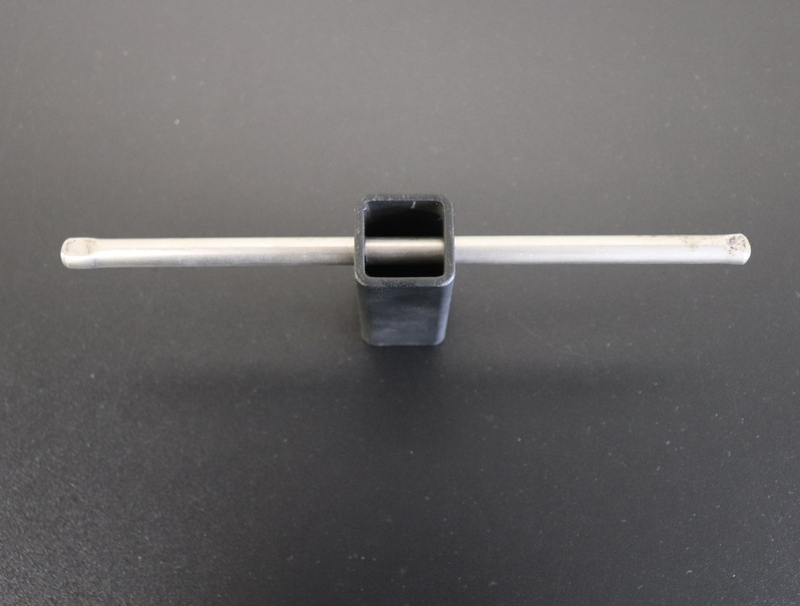 This tool is not provided by Winnebago and can be purchased by calling Lichtsinn RV’s Parts Department at 1-800-343-6255 or email us at parts@lichtsinn.com for assistance. The motorhomes that started the Mercedes-Benz Sprinter revolution just keeps getting better. 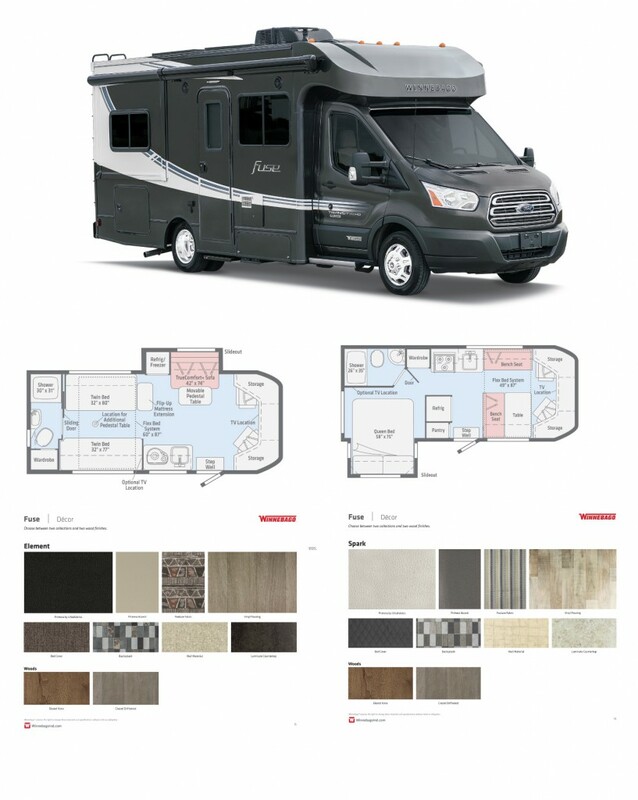 From the powerful and economical turbo-diesel engine to the elegantly appointed interior, the Winnebago View and Navion are the ultimate in efficient, luxurious RV travel for couples and families. 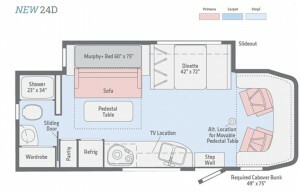 The View and Navion’s four slideout-equipped floorplans offer a variety of sleeping and living-space choices. 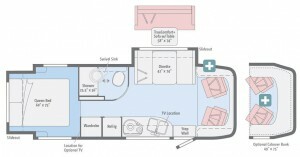 All feature swivel cab seats for added seating flexibility in the lounge, a powered patio awning, and a cabover bunk for added sleeping capacity. 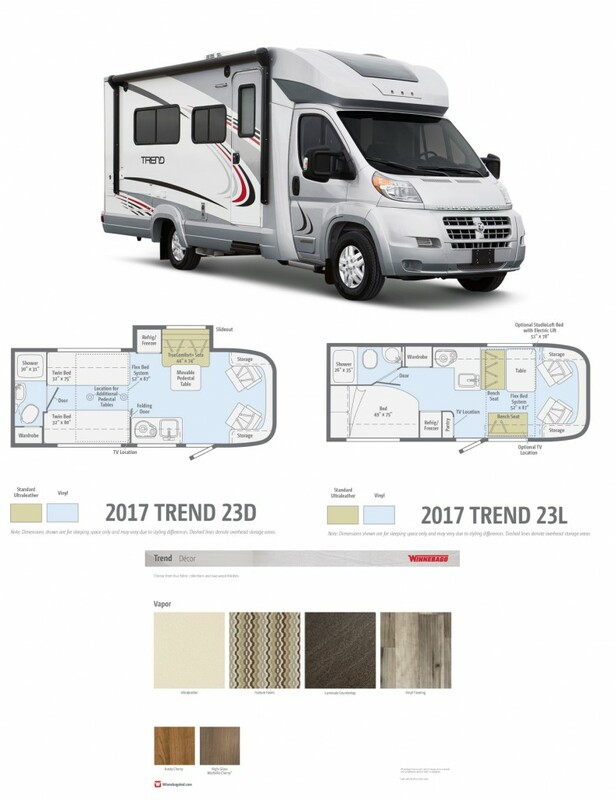 In response to overwhelming demand we now offer a completely restyled and re-engineered version of the Winnebago View and Itasca Navion 24M in the all new View and Navion 24D that features a large 36-inch depth full wall slide with dinette and a powered Murphy + bed with euro-style design support system and gel mattress. 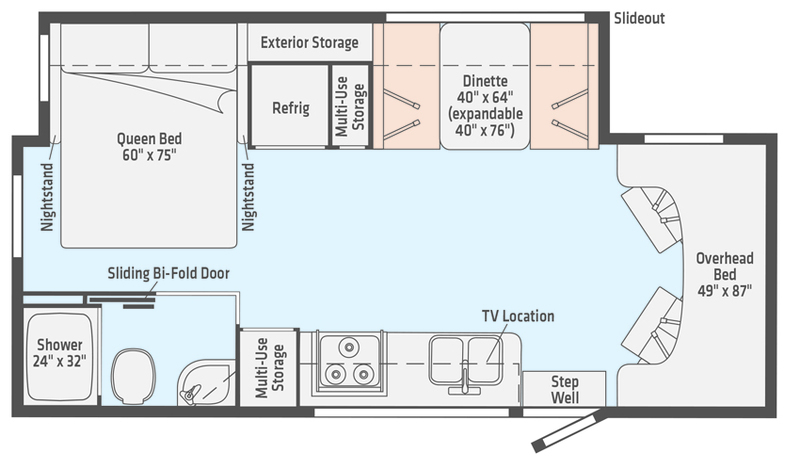 The 24D also includes a 7 cubic foot compressor driver double door refrigerator, so it’s both 12V and electric! Powering this are dual 100-watt solar panels with controller for the dual RV batteries. Inside you’ll find two stage dimmable LED racetrack indirect lighting for a contemporary feel. Infotainment Center with Rand McNally RV GPS, including an all new 9 inch higher resolution touch screen color monitor with responsive capacitive touch screen, Rand McNally RV GPS safe & easy routing, amenities and tools, trips and content, turn by turn voice guidance, CD DVD player, SiriusXM satellite radio, compass, outside temperature, iPod, iPhone, Siri Eye, audio integration, Bluetooth hands free calling, and so much more! 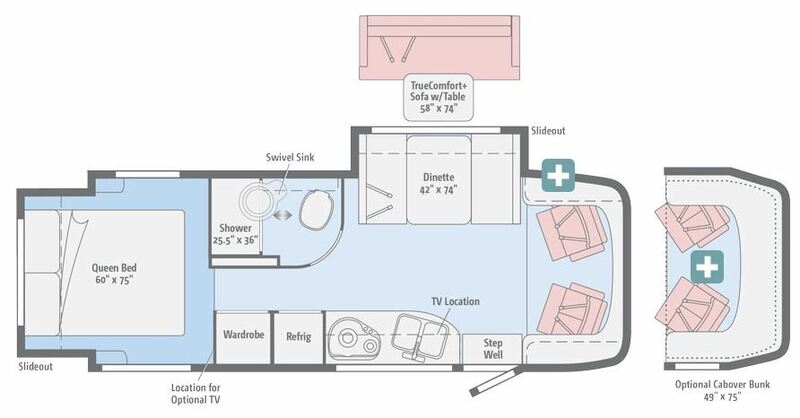 The very successful Winnebago View and Navion 24G floorplan with a dinette, including storage, safety belt, and converts to a 42 x 74 inch sleeping surface! To make way for this larger slideout, we have included an innovative European inspired swivel sink to create a larger shower and more room around the toilet. Also, inside you’ll find two stage dimmable LED racetrack indirect lighting for a contemporary feel. 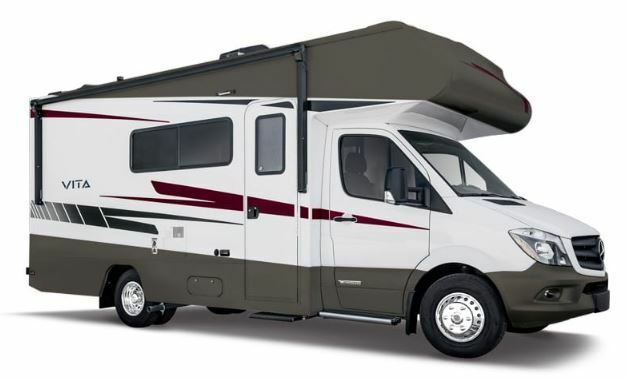 We also offer both models with a sleek aerodynamic low profile front end with a skylight and side storage, or additional sleeping capacity with the optional cabover bed. A 7 cubic foot compressor driver double door refrigerator, so it’s both 12V and electric! 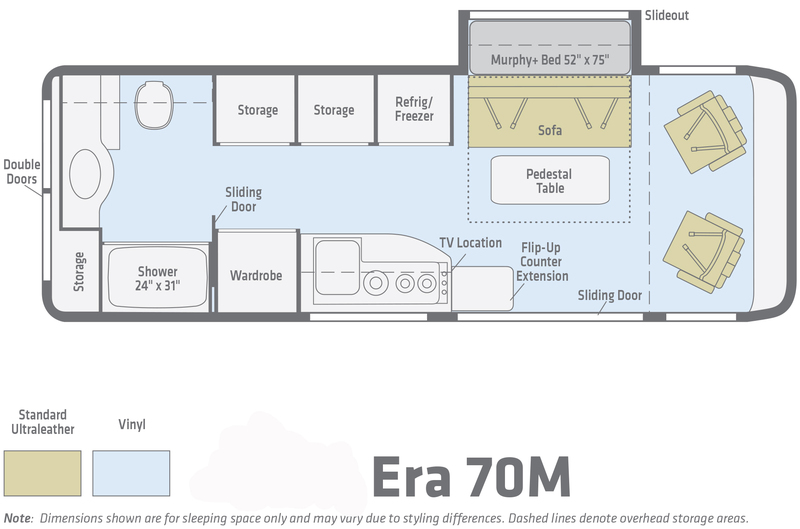 The Norcold dual door model features contemporary flush mount styling and features a quiet, hermetically sealed compressor, which is self ventilated for easier integration into RVs. The 12V fan aids airflow across the condenser and compressor for improved cooling and features a convenient automatic temperature control with storage for 2 liter, half gallon and full gallon containers. Powering this are 2, dual 100 watt Zamp solar panels with controller for the dual RV batteries. 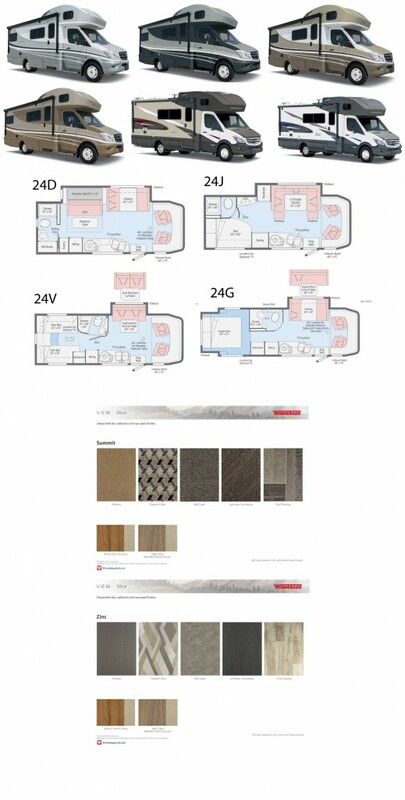 The Zamp solar package is now standard and expandable to add additional panels if desired. An upgrade to the 1,000 watt inverter to a pure sine wave inverter, for cleaner power to the upgraded audio visual components. The pure sine wave 1,000 watt inverter is now standard. The MaxxAir vent system has been made standard and includes a sealed vent to enhance off the grid camping. The sealed hood allows the customer to use the vent and fan in bad weather or even when the coach is not occupied. 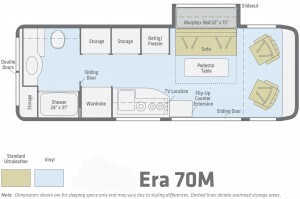 With its redesign, the View and Navion 24J offer a permanent rear bed at 50 x 80 inches, just shy of a queen bed, with 35 percent more interior storage than in prior years, 53 percent increase in glass for expansive viewing, especially towards the views of your patio area, and an over-sized U lounge that includes lift up ottomans to convert into two separate lounging areas towards your patio and TV viewing areas. The 24J has been lengthened in line with the rest of the View and Navion lineup, at 25 feet, 5 inches. 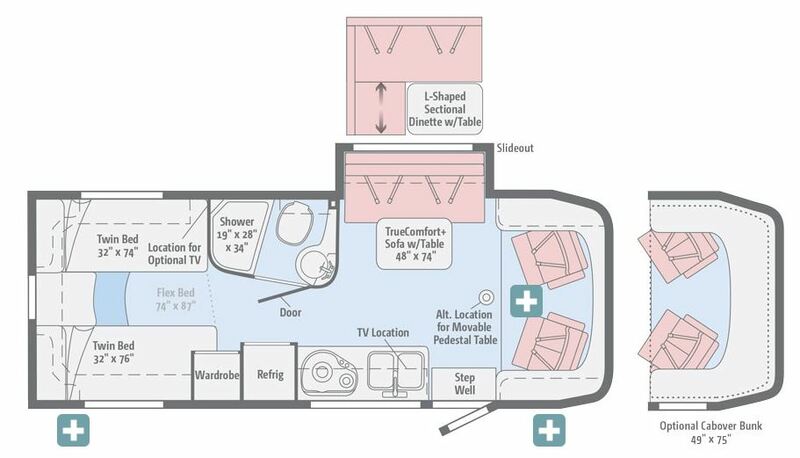 The Winnebago View and Navion 24V floorplan’s Flex Bed System quickly converts from two twins to a king bed, while your choice of the TrueComfort+ Sofa with table or dual recliners with table lets you truly make this your own. Rear pass thru storage access returns to the rear wall for convenient pass thru storage. 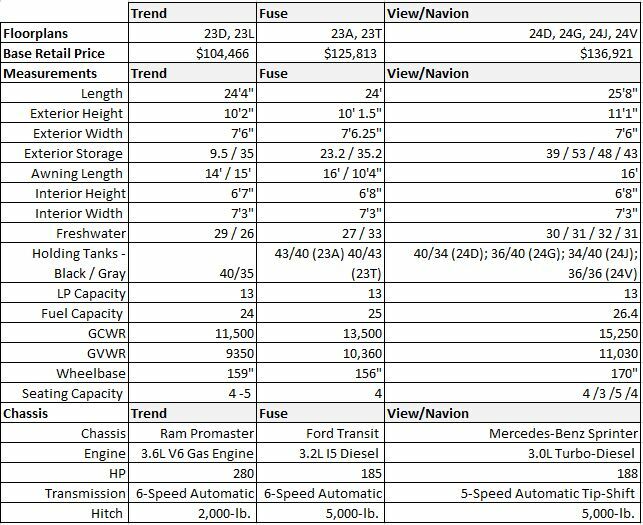 See our entire Winnebago View and Navion inventory Here.